From supply of clinical diagnostic reagents and instruments to operating management support, the LSI Medience Group responds to the diverse needs of medical institutions. The LSI Medience Group's respected track record in the development, manufacture, and sale of clinical diagnostic reagents and instruments is reinforced by its wealth of experience as an integrated clinical testing facility. The group offers comprehensive service and support, from clinical testing on behalf of medical institutions to the introduction of diagnostic systems. The group also brings efficiency and optimization to testing operations. "PATHFAST"is a new POCT (Point of Care Testing) system that allows for highly-sensitive and high performance measurements in conjunction with panel testing. A point of care testing (POCT) device suitable for use in conjunction with panel testing provides highly sensitive, high-performance measurements, while at the same time offering the speed and ease-of-use demanded in the POCT environment. "IATROSCAN" is the first Thin-Layer-Chromatography(TLC)-FID/FPD Dual Detection System in the TLC world. IATROSCAN MK-6 enables simultaneous measurement of organic compounds by means of flame ionization detector (FID) and flame photometric detector (FPD). All organic compounds are quantified by our own unique FID, and the hetero-atoms such as phosphorus and sulfur are selectively and quantitatively detected by FPD. IATROSCAN is optimal especially for analyzing of lipids or petroleum fraction types and tracing reaction process of organic synthesis. In this area of the company's operations we are constantly striving to adopt cutting-edge technology to provide our clients with the latest information from gene analysis and chromosome testing. Here we explain what the company is capable of accepting, and their contents, in carrying out research testing. In focusing on recent innovations in testing technology and the future of this field, LSI Medience aims to make a broad ranging contribution to the area of life science and looks to be actively involved in the development of research testing items. This area of the company's operations offers a broad-ranging analytical service that supports treatment for poisoning at clinical setting. This involves using our advanced analytical technology ability - the world-class level of which is evidenced by the company's ISO/IEC17025 certification relating to drug and toxicology testing and doping testing. 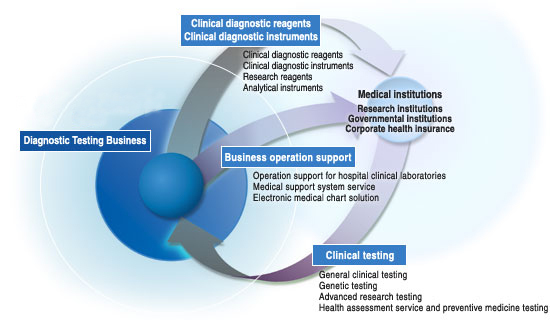 LSI Medience's involvement in providing a range of healthcare services such as our "health-check support" is based on our comprehensive clinical testing laboratory - one of the largest in Japan and which utilizes the latest testing techniques. From carrying out actual laboratory testing to coordinating medical examinations, the company is fully committed to providing the highest level of support for the development of preventative medicine. Electronic medical Chart solutions that can be used in conjunction with LSI Medience's comprehensive clinical testing laboratory, the company's "m-KARTE" is intended for use in support of basic operations within medical institutions. We also carry out demonstrations of a hands-on working model of this convenient system.